te Palm, scientific name Phoenix Roebelenii, is a great little palm for Arizona. The Pygmy originated from Southeast Asia where it grows wild. The Pygmy Date Palm is a small palm with single or mult-trunk varieties. 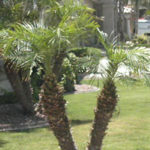 It is a slow growing, low maintenance palm tree with little to no mess and provides a tropical look to any Arizona landscape. It is a perfect option for a pool side plant. The Phoenix Roebelenii has a graceful crown of 50 or more very attractive arching feather-type leaves. It bears small insignificant flowers, and females produce small purple to redish-black fruits-dates. It is adaptable to different growing conditions, is extremely salt-tolerant and hardy to around 20 F for a short time with no damage. These species can be grown in full sun or partial shade. Phoenix Roebelenii can tolerate a wide range of soils, but prefers well drained soil and moderate water. We do recommend covering this palm if we have a freeze to prevent frost burn on the leaves. If is does freeze, do not trim it until spring and do not worry because this hardy little palm almost always come back.